As we know, it’s not good for our health to devote too much time to video games. So if you like racing game, let’s go on checking the Autobahn Tape Kit and Race Car that can bring the game from screen to your home. Just as we see, this fun kit includes a mini pull-back race car and a roll of tape measuring 2-inch wide by 108 feet long that looks like a mini race track once stuck on the ground. 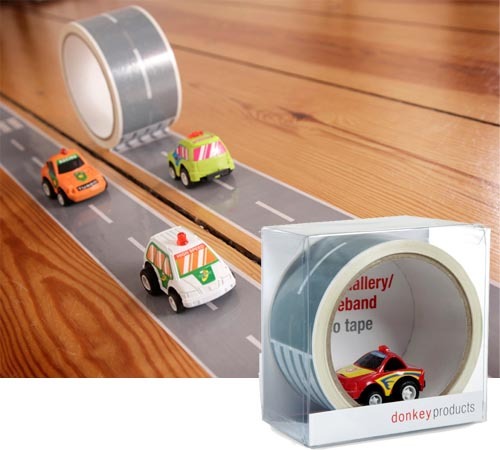 So with the help of the Autobahn tape kit, either you or your kid can create own roads with ease. You can even put two or more strips of tape side by side and build a bigger race track, and add some corners or blocks. Of course, you must prepare several race cars for your Grand Prix. Autobahn Tape Kit and Race Car is priced at $12.99 USD. If you’re interested in the relaxing way, jump to perpetual kid for more details.